Now if Lex had a stuffed tiger, that would be a strip. Having watched just a few weeks ago the Dear Mr. Watterson documentary on Netflix, and with Bill Watterson’s recent brief return to the the comics page, I was fairly well primed to revisit his famous Calvin & Hobbes strip. Fortunately, I own a set of the slipcased hardcovers reprinting the whole shebang and was able to satisfy this urge in short order. Unlike the esteemed Mr. Isabella, who has the astounding self-control to restrict himself to only a week’s worth of strips at a time, I would read huge amounts at any given opportunity, immersing myself in Mr. Watterson’s imagination for an hour or so. Ah, Calvinball. The great equalizer. It’s the one time the two characters manage to get along peacefully, bringing a happy ending of sorts to the long series of battles they’ve endured over the history of the strip. It’s no Charlie Brown finally saying “hello” to the little red-haired girl, but it’ll do. One of the big losses of the mid-1980s Superman reboot was losing the “fiendish schemes” of the “criminal scientist” era of Luthor, who was in at least some measure occasionally sympathetic and even funny, in favor of the cruel and unpleasant businessman Luthor. There was some slight return to the somewhat goofily-evil in-love-with-his-own-voice Luthor in the last decade or so, even to some extent in the post New 52 DC Universe, but nothing is quite the same as Lex in his green/purple tights and his bandoliers, zipping around in his rocket pack. 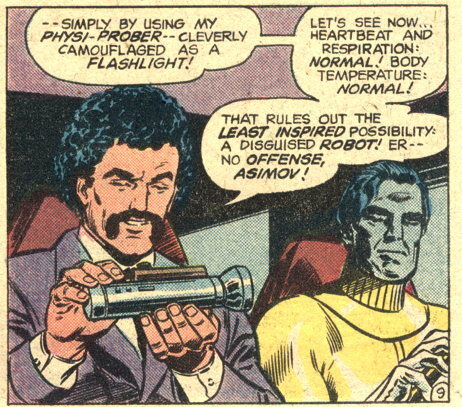 “Physi-Prober” “Camouflaged as a flashlight” Oh my god, Lex Luthor invented the Fleshlight! That looks more like Alex Trebek. What Rob said. And I’ve seen Trebek in person.